Yamaha's range of classic FM digital synthesisers extended over ten years from the 1980s into the early 90s. The iconic synths in the range were the MK1 DX7 and the SY77/SY99. Whilst their stock sounds were great, the synths rapidly acquired a reputation of being hugely difficult to program. FM-Alive has been specialising in developing applications for the DX/SY range for over 25 years. 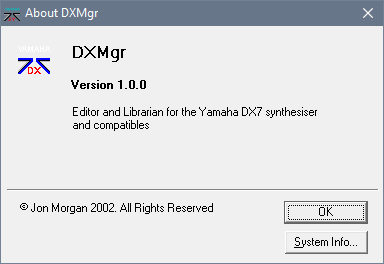 Our first PC editor and librarian for the DX7 (DXED) was released in 1988. SY Manager was first published on Compuserv in 1993. It was and still is the only full featured graphical editor and librarian available for the SY77/SY99. SYM introduced real-time "hear as you edit" graphical patch editing and DX Manager followed with similar features a few years later. Over the years both apps have been extensively rewritten and virtually all DX/TX and SY/TG models are now supported.